New York (TADIAS) – The following is an excerpt from Rebecca Haile’s new book Held at a Distance: My Rediscovery of Ethiopia. 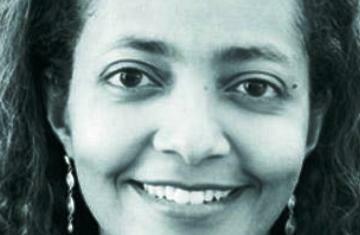 Rebecca Haile was born in Ethiopia in 1965 and lived there until she was eleven years old. When the Emperor was deposed by a military coup, Rebecca’s father, a leading academic in Addis Ababa, was shot while “resisting arrest.” Barely surviving, he escaped with his family and settled in central Minnesota where they struggled with the cultural and financial strain of their drastically changed circumstances. Rebecca grew up in America harboring her precious childhood memories of Ethiopia. She attended Williams College and went on to graduate from Harvard Law School. In 2001, she was the first member of her family to return to Ethiopia. With those casual words, my Aunt Mimi tried to prepare my sister Sossina and me to leave Ethiopia even as she downplayed the voyage by equating it with a Sunday drive to my grandparents’ home in the country. Mimi dared not promise us the trip to the United States, much less name a specific date. Those were unpredictable days in Ethiopia—days when people who disagreed with the regime didn’t know whether they would see the sun rise the following morning, days when, my uncle Tadesse swore, you couldn’t trust your own shadow. By then, government soldiers had nearly killed my father, and my parents had fled the country. How could my aunt and uncle assure us that no one would block our family’s reunion? Now, twenty-five years after those final tense days, I am on an overnight flight back to Addis Ababa. I am sitting next to my husband, Jean, staring restlessly out the window at the inky ground below. As we cross from southern Egypt into northern Ethiopia, an hour or so before we are to land, the horizon finally begins to lighten. Soon, the sky over the vast highland plateau is awash in a deep, clay red. Jetlagged and on edge, uncertain what to expect from the country I am not sure I can still call home, I am grateful for this beautiful prologue to the month that lies ahead. I left Ethiopia in 1976, two years after the army deposed Emperor Haile Selassie and sent a powerful wave of turmoil and state-sponsored violence crashing across the country. Along with countless others, my parents were swept up in that wave and soon the life they had built together had been completely washed away. In the summer of 1976, my parents, my sisters and I found ourselves abruptly deposited in the United States, stripped of our possessions and expectations and left to start over financially, professionally and emotionally. I was ten when it became clear we could not stay in Addis Ababa and had just turned eleven when my sisters and I reunited with our parents in a small central Minnesota town. That first summer, as we watched our host country celebrate its bicentennial birthday with fireworks and cheers of freedom along the banks of the Mississippi, not one of us imagined how long it would be before we would see Ethiopia again. When I returned in the spring of 2001, I was the first in my family to do so. From Held at a Distance by Rebecca Haile. Copyright (c) 2007 Rebecca Haile, Published by Academy Chicago Publishers, all rights reserved. Just cannot wait to read it and meet Rebecca either through her writing or in person. If the memoire is as engaging as the “trailer,” it sounds like a treasure. MORE! This book has mesmerized me. 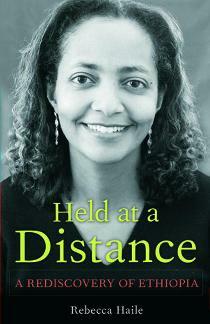 I don’t think i have ever read a book that i can personally relate to as “Held at a Distance”. In addition to the wise diction and description Rebecca Haile uses in her book, the simple fact that I am an Ethiopian who arrived in the United States a year ago, got me hooked throughout the book. I loved her theme and the point she is trying to make in her book! Also, I am writing a report on it for my cross-cultural communication class. AWESOME!